Let’s admit that this is hard for them. The reflected glow of Empire no longer sustains them in their dotage. The strain of being considered just another country has really become too much for them to bear. The realisation other nations have interests that may equal or supercede theirs, is a thought that they never before have had to countenance. Within the British political class this level of ignorance is more easy to understand. Politicians, after all, are generalists. They can’t be expected to know everything. It is the ignorance of many within the British media that truly astounds. A media that it meant to be informed so it can inform, seems particularly easy to manipulate. 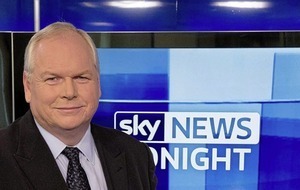 No one British ‘journalist’ seems to exemplify this more than Sky News presenter, Adam Boulton. Already compromised though working with Rupert Murdoch’s UK version of Fox News, Boulton’s puffed out vanity has led him to believe that his access to the British establishment makes him an integral part of that establishment, entitled to speak on its behalf. 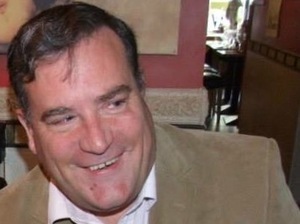 The wedding for his second marriage to Anji Hunter, then Head of the Policy Unit at 10 Downing Street, was attended by her then boss the British Prime Minister, Tony Blair. But romantic New Labour is dead and gone. It’s with Dr. David Kelly in his grave. It’s the Tory line that Boulton now has to spout. And spout he has, particularly during his recent interview with Simon Coveney. I like Simon. I get on well with Simon. That’s despite the fact there are many, many things on which we politically disagree. However, to give him his due, he was spot on in identifying Boulton’s questions to him as nothing other than British/Brexit spin. Boulton could have phrased his question as the British Government believe that you… Instead he parroted the British Government line as if it were absolute truth. It was shoddy, shoddy journalism. Wading into the twitter storm that followed, his use of the Ivory Coast flag instead of the Irish, and claiming the dismissive phrase ‘You Irish’ was the type of ‘You Guys’ banter no one should take offence at, is typical of an English arrogance we used to describe as being phlegmatic. Maybe this is the best opportunity we have ever had to rid ourselves of this national inferiority complex. The people we have been feeling inferior towards are idiots. At this point of our history we have a glorious chance to crush forever the pre-internet meme the ‘Paddy the Irishman’ joke. But let’s not be so cruel as Punch magazine was for many, many decades in caricaturing the Irish as apes. Apes are more evolved than Brexiteers. Looking for a political stocking filler? 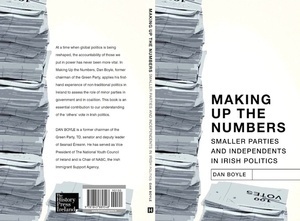 Dan Boyle’s new book ‘Making Up The Numbers – Smaller Parties and Independents in Irish Politics‘ published by the History Press is available at all good bookstores now. Is RTE Lol-ing At Its Own Since opening our doors in 2003, has delivered thousands of web and digital experiences, across a multitude of website design new delhi platforms alarge enough to offer you the knowledge and expertise we’ve gained servicing the Corporate and website design australia Government sectors, yet small enough to care. .
Posted in Misc and tagged Dan Boyle, Dan on Thursday at 10:10 am on December 14, 2017 by Dan Boyle. The line about David Kelly, though… slight wince. the city of Manchester has an economy larger then Ireland, dont embarrass us with this “the brits are done for…. THIS time!” schadenfreude, and while we’re complaining about a man saying “you irish” (you’d swear he called us potato n*****s), we’re perfectly happy to accept whatever paddywhackery the Americans throw our way. Are we? I seem to remember a lot of column inches being devoted to annoyance about the Saoirse Ronan SNL sketch. It has an economy smaller than Dublin, let alone Ireland. My god you are dumb. I’m not really sure what the problem was with his “you irish” comment. Will Boulton be a guest on the Late Late or D’Arcy’s show this weekend? If they’ll have dregs like Hatie Hopkins, they’ll have anyone. Do we have an inferiority complex? I’m not so sure. And we’ve always known that the British establishment are idiots when it comes to Ireland. While we can understand that Polish people might be ignorant of Ireland’s history, we’re appalled by the weird way the English powers that be seem to believe Ireland is some sort of faux-independent UK territory populated by quaint stereotypes and their complete ignorance of everything from the effects of Cromwell’s campaign to Bloody Sunday. It’s disconcerting to see otherwise intelligent people make daft statements about Ireland. Weird to see them unaware of their condescending and dismissive tone. Bizarre to watch as their faces turn to shock when something as petty as “the Irish question” actually interferes with British politics. Because most of the British establishment’s stereotypes of Ireland are either neutral or benign, times like this are a wake up call. The British are our cousins. We like them but they annoy the hell out of us. But no, I don’t think we feel inferior to them. We just wish they realised what most of our other relatives know – we deserve respect as much as any other nation. Superb comment. You should hang out here more often. We need more like you and me. Be prepared for charger salmon though..
As in ‘lie back and think of England’ dav? the uk brexit team got to trade talks without making any binding promises on the border. coveney had his eye wiped! Incorrect analysis, young man. You got a dose of the stewpitts. And the European Commission agrees with you. I saw what you did Broadsheet. Not like you to keep things to yourself, my little chav. What happened? What did the bad man do to you? You have to talk in monkey speech to it now. One who has an inferiority complex AND a chip on his shoulder. Failure is the bitterest pill to swallow. I’m sure you managed just fine, old chap. Oh dear,some desperate censorship going on at Broadsheet Towers today. Oh how awful…*checks wikipedia*… George. Maybe you should relax and enjoy a traditional British food, me old… *googles*… Beany Marmite. Lol Nigel, Fray Bentos pie anyone? Leave Fray Bentos pies out of this. I was surprised to see a Fray Bentos factory in Argentina years ago. Though now I’ve checked it, it seems as if it was in Uruguay. Hmm. I was only there for an afternoon, so that can’t be it. Someone remember it properly for me, please. I can’t, Old Boy, it’s what puts the ‘Great’ into Britain, fine dining Brit-style. It’s easy to mock but don’t forget all the Georges who were lost during the Great Beany Marmite Famine. The irony in Dan using the words of one buffoon and applying it to an entire country of people, now that is shoddy shoddy journalism, them bleedin’ foreigners, eh Dan? Dan isn’t a journalist. He’s an opinion writer. So Dan has accused a journalist who asked a perfectly reasonable question, which Coveney easily dealt with, of parrotting a British government line. A criticism worthy of Donald Trump, the other public representative who regularly misrepresents what journalists are doing. Bolton is Trumpified, bless him.